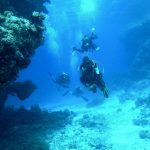 The original PADI Divemaster Fast Track internship. PADI Divemaster internship GoPro 6 is the Ideal package for people who are short on time but not short on experience. Entering into a new exciting and challenging diving career will allow you to go places, go diving, meet new people and do things underwater that you never believed possible! The PADI Divemaster internship GoPro 6 has been created to as an intensive training program designed to assess the skills and theory required to become a PADI Divemaster. Professional level of diver Education. The week is spent assessing your skill, theory and stamina levels and retraining where required. As our most intensive program you will be given a dedicated PADI instructor to help you through all the assessments and exams. A schedule of the requirements is sent to you prior to your arrival so you know what areas to brush up on before your arrival.